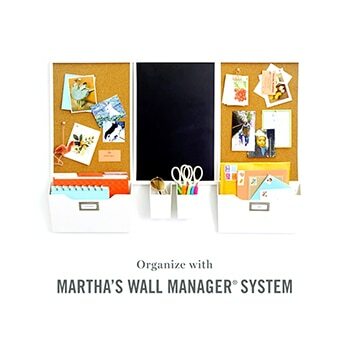 Create an organized workspace at home or in the office with the Martha Stewart office supplies collection. Featuring stylish filing solutions and desktop accessories, these products can help track busy schedules and store household records or keep student notes and assignments organized. Staples carries a complete selection of Martha Stewart office supplies, including personal organizers, dry erase boards, traditional binders, and discbound organizers. Everyone has different recordkeeping and scheduling needs, and these products include tools to handle a few household bills, a semester's worth of class notes or a large business project. Martha Stewart Stack Fit shelves, drawers and trays offer modular document and office tool storage. These products also come in a broad range of coordinated colors and finishes that look good in almost any room. Discbound notebooks let users customize their personal organizer with inserts such as pockets, calendars, tabbed dividers and writing paper. Posting important notes and dates in plain view is an excellent way to ensure they receive the attention they deserve. Hang dry erase or cork boards above a desk or in the kitchen to provide space for to-do lists or reminders. Erasable calendars make it simple to track work schedules, school events or project deadlines. Brightly colored liquid chalk markers let you create eye-catching notes to highlight special occasions or important meetings. Does the Martha Stewart Office Supplies Collection Including Filing Products? Many households and businesses run on paper records, and a well-organized storage system makes it simple to find the documents you need quickly. Use desktop trays for current project files or bills and then shift records to magazine files for long-term storage. Use lidded file boxes to protect sensitive papers. Most Martha Stewart filing products have nameplates, so it's easy to identify their contents without digging through a stack of papers. How do Discbound Organizers Work? Martha Stewart discbound organizers have several rings that hold specially punched pages in place. Unlike traditional binder rings that open and close, the rings are solid. The pages have a narrow slot that lets you slip them into place. Discbound binders lie flat when they're open, and the covers pivot 360 degrees, which saves space when taking notes. Martha Stewart discbound notebooks come in letter, junior and memo sizes, and accessories such as rulers, lined paper, tabbed dividers and cardholders let each user create custom Martha Stewart notebooks that meet this or her personal needs. How do you Hang Martha Stewart Calendars and Bulletin Boards? Most of these products have adhesive backings that stick to almost any smooth surface. They leave no residue when removed, and some products are reusable. Calendars and dry erase decals are flexible so you can use them on flat or curved surfaces. Filing and organizational accessories simplify household and office management tasks, leaving you with more free time. They're an excellent tool for busy parents, students or business professionals. Explore the Martha Stewart office supplies available at Staples and find desk accessories, filing solutions and scheduling aids for your home or business.